Friday’s post discussed the common diagnosis of altered passive eruption. We looked at the process and how to identify patients whose dental esthetics has been negatively impacted by this process. When we think that part of a treatment plan will include altering the gingival esthetics, one of the things we are tasked with is determining where we want the tissue to be. The first step as always is making a determination about incisal edge position in the face. Using a lips at rest photograph and full face image for my patient with altered passive eruption, we determined that her incisal edges are correctly positioned. Once we know the position of the incisal edges (either existing or a planned position) we can then use this information to plan the position of the gingival margins. 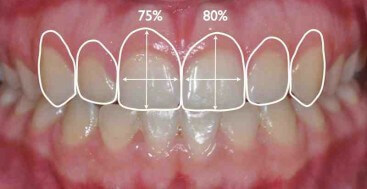 Tooth proportion becomes the next building block in the planning puzzle. 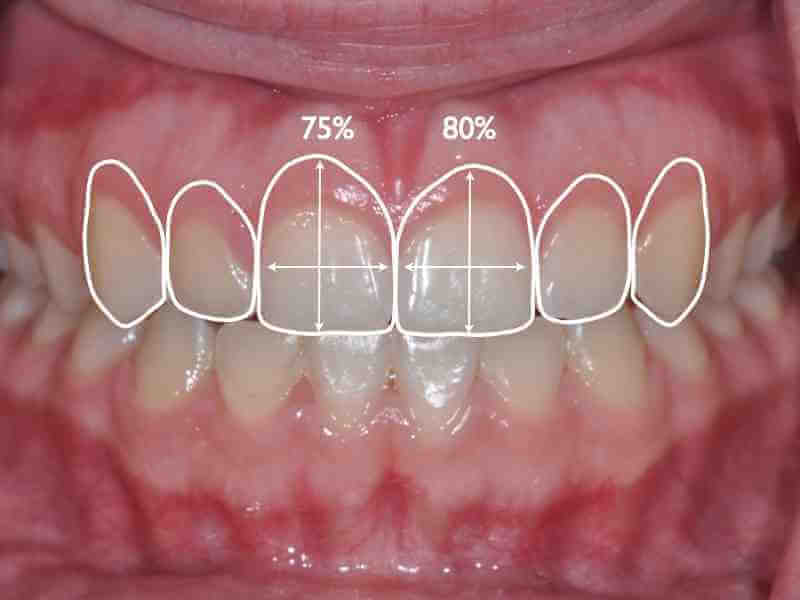 When we look at esthetic evaluation we know that beautiful anterior teeth are usually between 70-80% width to length ratio. This variability allows us to accommodate other clinical considerations, as well as patient preference. As a starting point I begin with 75%, and then look at the other parameters. If the patient has excessive gingival display, and one of the hoped for outcomes is to minimize the amount of gingiva, you may want to alter your drawing increasing the length and then evaluate the esthetic result. On the other hand if you have excessive sulcus depth and you want to see what the esthetic outcome would be if you stay within the confines of the sulcus, place the proposed gingival margin accordingly and assess the result. The final placement is based on creating an acceptable esthetic result for the patient. I find it much easier to look at this without the patient photo in place and only looking at the proposal. The drawings are done in a presentation program like Powerpoint or Keynote. This is a technique I learned in Facially Generated Treatment Planning at Spear Education. I create the template with the patient and we move the lines around together until they are happy with the position. Once we have the final proposal, the next step is to determine the possible treatment options to gain the intended result. The information can easily be transferred to a wax-up or used to create a snap on trial smile, which we will do in the next post. I love the photo visual. It is one of the best ways to communicate with patients I have ever learned. Thats a great technique. How do you go about ‘drawing’ the template though Lee? These are done in Keynote ( I use a mac) or you can do them in Powerpoint. Take a retracted teeth apart photo of a beautiful, near perfect smile. Put it into the presentation software. Blow the image up to like 200% and then using the free form drawing tool, trace the outline of the upper six anteriors. Take the photo out and save the presentation as template.ppt or template.key. Then when you want to do a pt plan or presentation, open it, insert that patients photos, do a save as with their name. Then you can copy and paste the tooth outlines onto any of their photos to show them, you can also resize them , it’s quick if they have been drawn before and saved as a template. i’ve eagerly interested in your practice .as a consultation how can i improve my practice ?do you have any continuing education courses? If you want, you can use the contact form to send me a private e-mail and I would love to hear more about your practice and help with some questions. As for courses I have two programs I am offering right now. One is clinical and on occlusion https://leeannbrady.com/occlusal-diagnosis-identifying-risk-online-seminar. The other is a team program and is about practice change . They are both listed under the courses tab at the top. I also teach all over the country and those programs are listed on the home page right hand side as you scroll down.